The antiquated meaning of dread is to regard something with ‘great awe or reverence” as opposed to ‘fear or apprehension’ that we more commonly associate with the word. It is beautiful that, like a picture, one utterance can hold apparently opposing directions of thought. Whichever way you look at it, a shuddering sensation in our gut, at certain moments in our lives –and not unusual to many as the year draws to a close– is a preferred option than to be soaked in a glittering, automated happiness. 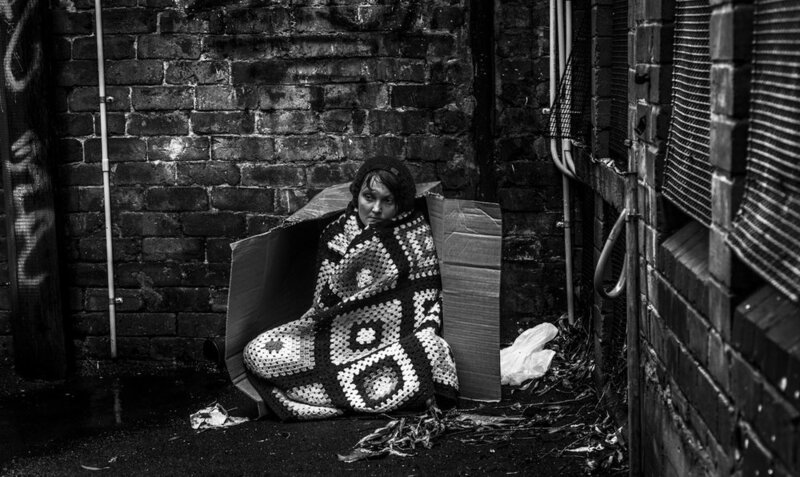 The image above was taken in early December 2012, Kobbie enacted the life of a homeless teenager in a laneway which, in a not too distant past, was her bedroom for close to a year. She was one of many students we worked with at the Oasis youth center in Sydney, a refuge for street kids and a place that enabled them to get back on their feet while engaging in creative projects like PALM, a photographic program which we developed. At Oasis, Christmas was a dark time. After this photo session which Kobbie devised and directed for an ad campaign, she exclaimed how much she loved being in front or behind the camera and how much it was a perpetual gift in her life. Hearing that was just the best present, ever.